Alright, you’ve just signed up with FaxFX. Have you checked your inbox? Have you got that fax number? Perfect. Now let’s get started. Online faxing is the fastest and most efficient ways for you to send and receive faxes worldwide. Provided that you have access to internet, your faxes can be viewed as far away as South America, simply by logging in to your inbox. The fax number that you receive from us is yours to keep; think of it as a cell number for your faxes. As simple as online faxing is, it’s also eco-friendly. Without the use of a fax machine or paper, you are greatly reducing your impact on the environment. Landfills are one of the world’s biggest pollutants. They are filled with millions of tons of electronic waste ranging from cellphones to televisions. Of course, there are a few fax machines in the pile, which is why online faxing is such a good idea. Using an existing computer, your faxes can be sent and received. They need not ever be printed. Don’t stress, as we store all of your faxes indefinitely. If you need to access a fax from a few months ago, all you need to do is log in. Our lines and servers are secure, and your information is only available for you to see. Any faxes that you send or receive are treated as confidential, and archived faxes are safe with us. 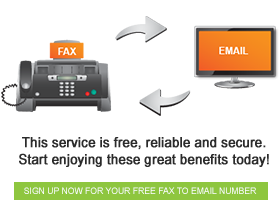 A leading provider of fax to email, FaxFX guarantees satisfaction with our services.